Several weeks ago I was honored to preach the funeral of Nell Ray. When Nell entered the world in 1916 a postage stamp cost 2 cents and the Eiffel Tower was the tallest building in the world. When she graduated college, her alma mater Texas Tech University was itself only 9 years old. Just shy of 102 years old when she went home to see Jesus, Nell left a legacy of kindness and service to everyone who knew her. When the graveside service was complete I stepped away as family members paid their final respects to this godly woman. Looking around, I saw all the headstones. Cemeteries fascinate me. When I’m on road trips I readily follow the signs pointing away from the main highway, down gravel or caliche roads to cemeteries off the beaten path. In my home state of Iowa many cemeteries are surrounded by big trees. The place where my family members are buried is virgin prairie, ground that’s never been turned until it’s time to lay someone to rest for the last time. Here in West Texas, cemeteries are often nestled in the middle of cotton fields. A mix of history, place, and personality they are a healthy reminder that life on earth has a beginning and end. Headstones from long ago are often simple. A name, a born date, a dash, and a death date. Some are ornately carved with angels and cherubs. Some reflect significant events and affiliations, or a talent they were known for. Those who served our country in the military have their rank and where they served. 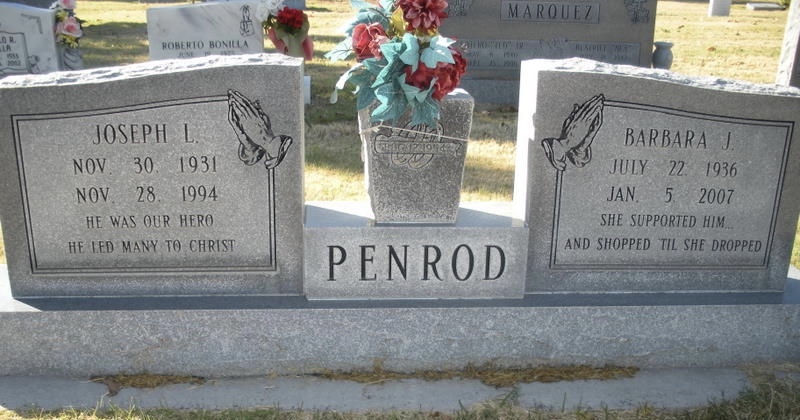 In the Lubbock cemetery is a headstone of a POW soldier who survived the Bataan Death March. A remote cemetery not far from where I live has headstones of Confederate soldiers from the Civil War. Looking around after Nell’s graveside service I was reminded that many modern cemeteries have rules requiring headstones lay flat, flush with the ground. It makes it easier for the groundskeepers, they say. Lawn mowers can just drive over them. With respect to cemetery groundskeepers everywhere, the primary function of a headstone shouldn’t be for the convenience of those who cut the grass. A headstone should get our attention. They should stand up above the ground. They should be something we bump our knee on. A granite attention getter that makes us stop and consider the dash before that chiseled and final four digit number. As the saying goes, every day above ground is a good day. As long as you are circulatory and respiratory, God is not finished with you. It matters not where your final resting place will be. What matters is that you’re living fully every day for God and others. This week, go take a walk through a cemetery. Be reminded of your mortality and how wonderful it is to be alive. Knock your knee into a couple of those headstones sticking up out of the ground. The ones bidding us to stop and remember the day is coming when we’ll no longer walk on the grass.